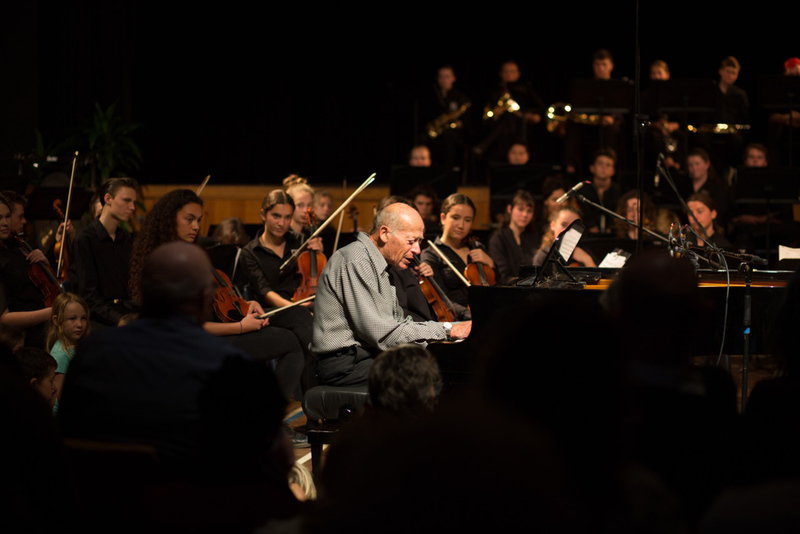 David Helfgott is the astounding pianist made famous through the 1996 Oscar-winning biopic Shine. Many of his admirers regard him as the greatest concert pianist since Horowitz, citing his technical skill and the unique passion that he brings to his playing. His greatest admirer is his wife, Gillian, who tells the tale of a love at first sight that has lasted thirty years. 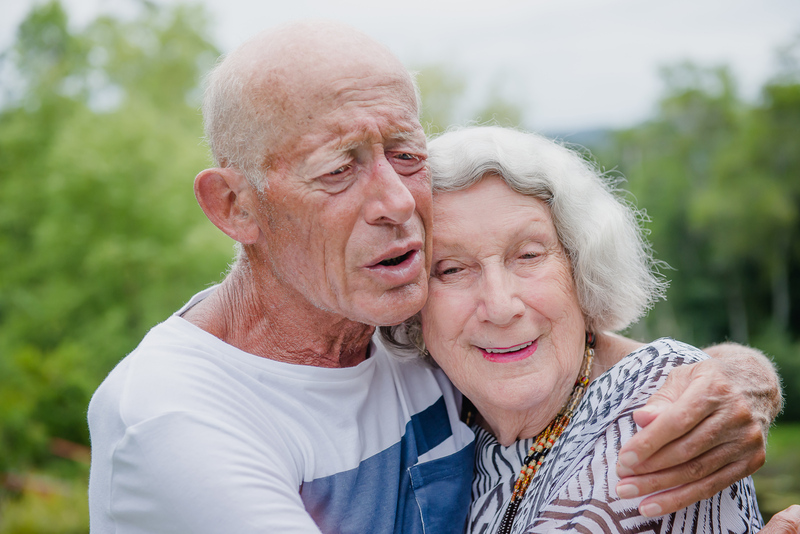 To interview David and Gillian Helfgott we leave Bellingen for the Promised Land, traversing winding roads through lush greenery, crossing Never Never Creek. We approach their house via a small bridge over a tranquil lily pond, overhung by luxuriant greenery. 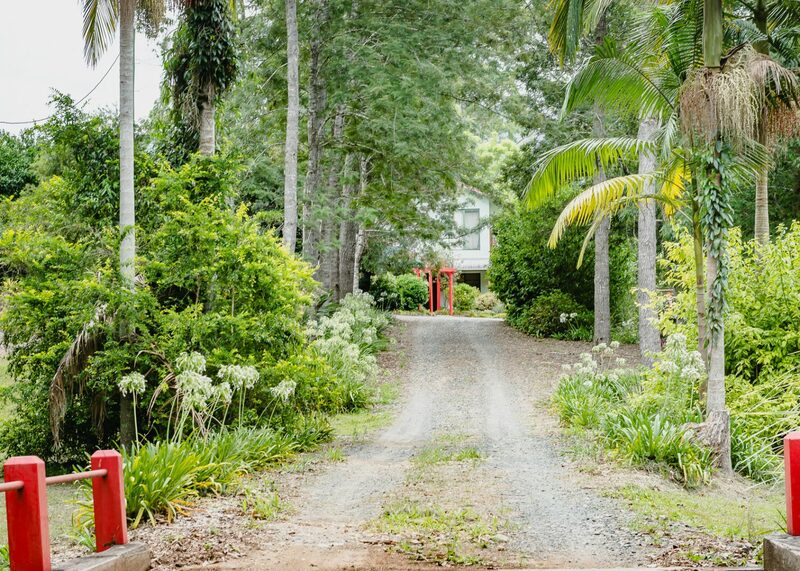 In the distance, across landscaped lawns dotted with outbreaks of wild tropical flowering shrubs, there is a second lily pond, decorated by a delightful bright red, arching footbridge. A figure darts from the front of the house. It is David Helfgott. He raises his arms and to our surprise, releases a small bird into the air, then turns and runs inside again. The whimsy of our first impression continues throughout the next two hours as David and Gillian entertain, charm and enchant us. They greet us in a rush of hugs, then David whisks photographer Sooz off, saying “You’ll want to see the piano? Of course you will.” He doesn’t wait for an answer; Gillian and I retire to the elegant interior of their home. ‘Settled’ is a misleading verb within the Helfgotts context. Even before the success of Shine, David maintained a demanding schedule of concert performances, which continues today. 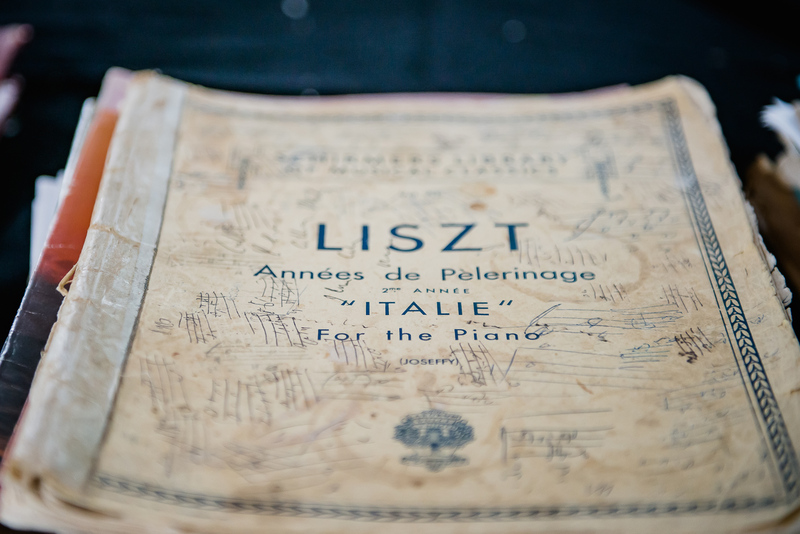 The Helfgotts have just returned from a four-month tour of Europe, performing in Paris, Budapest, Denmark, Copenhagen, Zurich, Vienna and Istanbul, playing to packed houses and critical acclaim. 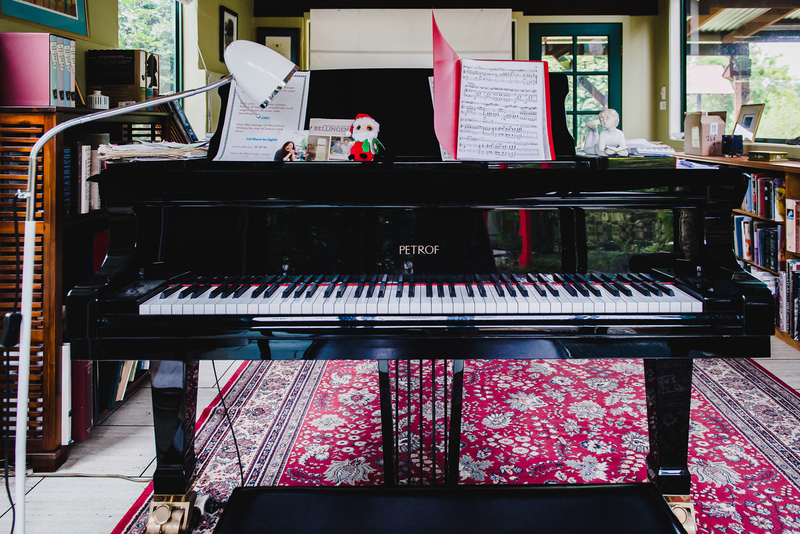 From the piano room we hear strains of Nikolai Rimsky-Korsakov’s Flight of the Bumblebee which, along with Rachmaninoff’s Piano Concerto No. 3, is one of David’s signature pieces. I find out later that it is a favourite of Sooz and David has delighted her with a performance. Such generosity is a hallmark of David’s musicianship. The frenetic energy of Flight of the Bumblebee seems appropriate for David, who buzzes in minutes later, dragging Sooz by the hand. He is keen for us to have a cup of tea. He gives everyone a kiss, then rushes off again. As I follow Gillian to the kitchen I hope that Sooz is managing to get some shots in. On David’s website there is a remarkable image of David playing while a leopard lounges atop his piano. Gillian tells me it was fascinated by him and kept licking his hands. David has already told me that he spends a lot of time swimming. David and Sooz return for a cup of tea, served in beautiful Klimt crockery that is in accord with walls hung with paintings, richly hued upholstery and a symphony of green glimpsed through long windows. The Helfgott home is a haven. It’s my turn in the piano room now. David and I talk a little of his love for the Romantic composers and I confide that my favourite is Smetana. Immediately he plays The Moldau, his quicksilver fingers lightly teasing out the opening bars before launching into the dramatic main theme. To my surprise I stand and join him, singing along as best I can. We find our way through until David stops playing. We walk outside for photographs of Gillian and David by the lily pond, then, suddenly two hours have passed, and it is time to leave. We are embraced and sent on our way with invitations to come again; the spell of the Helfgotts lasts all the way home and then some.